Every April I begin a series of Earth Day posts, usually involving tips on greening your routine or various friendly recipes. This year, however, I discovered a funny, wondrous thing I began preparing for April 22nd: All my blogs and social media posts reflected my deepening commitment to a green lifestyle, regardless of the time of year. Woohoo! I’ve been going more and more green, especially now with the heartbreaking news on climate change. But what used to be a series of posts once a year on how I do that has become regular reflections on how a more zero-waste lifestyle is an integral part of who I am day-in, day-out. More than that, my work, be is something as specific as my regular-ish #SustainableSaturdays posts on Instagram, or as broad as a new blog or short story, reflects how intrinsically my sense of wellbeing is tied to tending my relationship with nature, from dramatically reducing my plastic use to planting my radish seeds. …which is all by way of saying that one of my day-in, day-out green living routines is tending my own vermicompost right on my own little garden patio. I started doing it a few years ago when I realized how many food scraps and odds and ends I threw out. Actually, I grew up in a home with a lush wild garden and an active compost, but, apartment dweller that I am, I just assumed good old fashion composting was something that would have to wait for a real home and a real backyard. After realizing I could be reducing the food waste that goes to landfills relatively simply, I decided to invest in a vermicomposting tray (FYI vermicompisting is just a fancy term for composting with worms in trays or tubs). I consulted my mom. I talked to my hippy friends. I went down an internet rabbit hole. Each and every source told me that composting, especially from bins or trays, was something I could easily do, even from my humble apartment, without attracting rodents or committing to a super labor intensive practice. Cut to me a few years down the road with a flourishing compost, happy plants benefiting from the fertile soil, and more worms than I know what to do with. My waste has declined dramatically too. 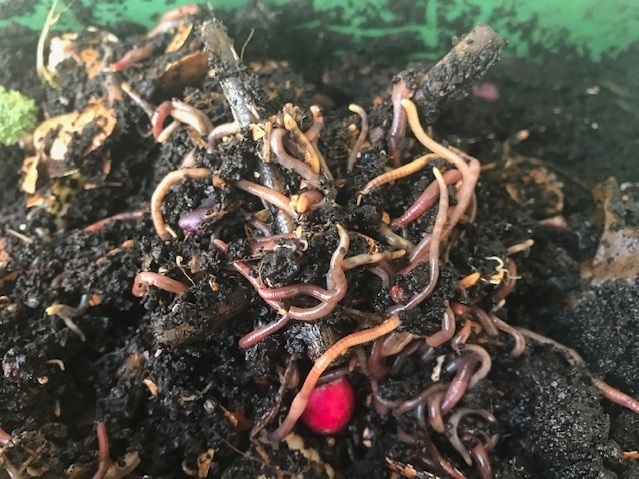 I keep my food scraps in a tupperware bin in the fridge and, once a week or so, take them out to the compost to feed my worms. I now shred paper mail and happily spread it around my vermicomposting trays as welcome roughage for the little guys. It’s incredibly rewarding to see what is essentially trash or discards find a new life feeding plants. If you want to go full garden-nerd about this, the worms and fresh compost make great gifts for your fellow gardeners. Also, let’s be real: My writer-heart sees a big whopping metaphor in the whole act of taking things that no longer serve us and making them the foundation of future fertility. Sustainable Baby Step’s Beginner’s Guide to Composting has everything you could possibly need, from how to get started, to what you can and can’t compost, to what to do with all the wonderful soil once the worms have had their way with your food scraps. Food Print’s Vermicomposting 101: is a thorough set of instructions for how to set up your compost and make it friendly. Eco-cycle’s troubleshooting section is especially helpful if you are running into issues like having a smelly or wet compost. They can tell you why what’s going on and how to fix it. Green Action Center’s FAQ is another fantastic primer on all things composting, including why it sometimes looks like nothing is happening (but really it is). This Earth Day, commit to reducing your food waste. Commit to taking things that would otherwise end up in landfills and turn them into gardener’s gold. Feed worms. Grow vegetables. Be one with nature. Happy gardening and happy composting! I love beets. They are second only to the humble radish, whose peppery bite will always be my first love…in terms of root vegetables, that is. But what the radish has in spring spice, the beet makes up for in earthy, meaty sweetness. And like the radish, the humble beet is best when you don’t do too much to it. This recipe for beet carpaccio came about because I had purchased the most beautiful beets and meyer lemons from my local store. I swear, the lemons looked so big and juicy I thought they were small oranges! The eye-popping color of both produce items had me thinking of a tasty jewel-toned dish that would work as a Saturday night salad or starter. …and you all know I’m always working on making my lifestyle more and more green, including in my cooking. Eating little or no meat is one of the best ways to cheaply and effortlessly help the planet. While I’m not a complete vegetarian, dishes like this, a play on the classic beef carpaccio, make me love being a veggie eater. Meyer lemons are only in season so long, so if you can’t get them, regular lemons will do, as will oranges, if you want to play around with other citruses to get different flavors for your carpaccio. Just make sure you use organic produce (as always), especially because you will be using the zest. Non-organic citrus means you’ll be sprinkling pesticides in your salad as well as zest, yuck! I used pistachios in place of capers found in the traditional carpaccio, both to mimic the color of the brined berries and to add a touch of nuttiness. The homemade salt combo is what really ties the flavors together, however. The mustard, orange, and onion act as a savory sweet balance to the tart citrus. Did I mention I love the colors of this salad? The dark red of the beets, the pop of green from the pistachios, and the sprinkle of yellow from the lemon zest…it’s a work of edible art, perfect for a fancy Saturday night dinner (in your jammies, natch). 1. Heat water in two quart sauce pan until boiling. 2. While water boils, wash and peel beet. Place in hot water and boil until soft, about 20 minutes. Remove from water and let cool, at least an hour. Then place beet in the fridge and let chill for a few hours. I like to cook my beet in the morning and then pop it in the fridge until dinnertime. 3. While you let the beet chill, combine ingredients for salt and place in salt mill or use a mortar and pestle to grind. Note: You will have more of this salt than is necessary for the recipe. Trust me, this is a good thing. It stores indefinitely and is great on all sorts of dishes, from a tangy citrus chicken to summery roasted veggies. 4. When beet is fully chilled, use a mandoline or sharp knife to cut paper thin slices of the beets. The mandoline is a little easier for this. If yo use the knife, the slices won’t be uniform (unless, of course, your knife skills are better than my so-so ones!). 5. Arrange slices in circle formation on two plates and drizzle with olive oil and lemon juice. 6. Then sprinkle a smattering of your fancy salt, to taste (I like it easy on the salt, myself). 7. Finally, add the lemon zest and pistachio pieces to each plate. Eat immediately. Serves two. Enjoy! How did I know to trust my instincts that a relationship was well and truly over? I was thinking about the whole situation and, when I turned on my car, the radio blasted, “the thrill is gone…” Boy was it, and to ignore that would only cause more heartache. And what gave me the courage to turn my blog posts into the manuscript that would become my award-winning Everyday Enchantments? A random folded paper tucked into an old book I’d decided to reread. On that piece of paper was a series of scribbles from my teenage self thinking about the day when I would be An Adult and a Published Author. I started working on my new manuscript that afternoon. Without those insights—those little nudges from life telling me I’m on the right track or ready to move on—I wouldn’t have been brave enough to listen to my inner wisdom. You would be surprise what the universe is willing to reveal if you simply ask it and stay open to the answers it might give. Get loose. Real talk: we live in a world that values concrete, rational things—all good and well in their right place—but synchronicity is a different kind of literacy all together. It’s about opening yourself to the possibility of a new way of being. Often times, our innate instincts and unfiltered feelings get buried under the pressure to conform to social norms. Instead of allowing ourselves to introvert when we need to introvert, for example, we push past our needs and do more, get louder, and move faster despite our soul’s longing for quiet. Loosening up allows us to let go of rigid expectations or assumptions about how things should be so we can be open to the magic around us. Get playful. When was the last time you stayed up past your bedtime reading? Or ditched the to-do list in favor of a schedule-free Saturday? Or danced in your pjs to your favorite song? If its been awhile, now is the time to welcome that playful energy into your life. Be like the otter, an animal that devotes as much time to play as it does to work. Why? I’ll let you in on a little secret: Synchronicity is pretty darn playful. It’s a lot like Coyote, that perennial trickster, sneaking up on you when you least expect it, catching you off guard, forcing you to rethink your world view. The best way to be open to these insights is to let go of hard and fast rules and just…get playful. Get curious. Synchronicity is all about opening yourself up to the world and remembering that child-like curiosity with new places and things that delight the senses. This kind of energy loves questions, exploration, expansion. Often our sense of wonder gets lost as we succumb to the demands of day-in, day-out. Take a moment—pause, breathe deeply, and think about what it used to feel like when the changing seasons created a sense of unblemished excitement for something now or they way a sunset was like an open invitation to marvel at the beauty of life or how a winding dirt road was the promise of an adventure. Then turn that innate curiosity on your inner landscape—forget to push and prod and contain difficult feelings or old selves and simply marvel at the fact that you contain multitudes, like so many tiny cosmic seeds waiting to be explored. Synchronicity is found in these silent, joyful explorations. Sometimes we throw out questions to the universe and get an answer maybe that instant, maybe a week or month from now. More often than not, however, the answers come when we’ve forgotten to fixate on whatever it is we want answers to. Sometimes we even get nudges and insights to things we didn’t know we even had questions about. Synchronicity is like that—trickster that it is—deciding what questions you get answers to and which ones you just have to struggle with on your own. Or if it sees you forgetting to enjoy the wonder around you, well, like Coyote, it won’t hesitate to shake up your order a bit. However synchronicity comes into your life, it is a reminder to tune into the magic of your every day. Often the wisdom it imparts is immediately and intuitively understood, so don’t worry it like you would a loose thread on your jacket. Just feel what it is asking you to feel. The answers will come. Be warned though: The more you invite synchronicity into your life, the more it will manifest unbidden, as if it only ever need your time an attention to reveal itself to you wholeheartedly and without restraint. And with more meaningful, soul-illuminating coincidences, comes more magic. Enjoy. Enchantment Learning & Living is an inspirational blog celebrating life’s simple pleasures, everyday mysticism, and delectable recipes that are guaranteed to stir the kitchen witch in you. If you enjoyed what you just read and believe that true magic is in the everyday, subscribe to my newsletter for regular doses of enchantment. Want even more inspiration? Follow me on Instagram, Facebook, Pinterest, and Twitter. Here’s to a magical life! I don’t know what it is about January and February, but I always find myself tinkering more in the kitchen this time of year, trying new healthy recipes. Maybe it’s the cold winter nights, maybe it’s the promise of spring and new things on the horizon, or maybe it’s just because I love the idea of trying something that shakes up my routine. In any case, I find that there’s nothing better come Saturday night than an old jazz record, a beautiful cocktail, and a crisp apron as I go about trying something new. One such evening produced this lovely recipe for butternut squash steaks. Like my cabbage steaks, this dish is warm, hearty, and healthy—for you and the planet (one of the easiest ways to be eco-friendly is to eat less meat). It’s also incredibly versatile and relatively low-maintenance, once you get past the peeling and slicing part. For this recipe, I went old school and seasoned it with garlic and rosemary, but I have plans to try other more adventurous combos, like tarragon and shallots. You will mostly be using the longer top part of the squash for this to get the “steaks,” but I recommend dicing up the remainder of the veggie and cooking them for a future quick lunch with tossed with lettuce and garbanzo beans or boiling to use as a puree for soup. You can do a quick roast of the seeds in a frying pan—no cleaning needed, just let the pulpy matter get nice and crispy. Yum! Go ahead and toss the remaining scraps in your compost—your worms will thank you and so will your garden. I’m all about reducing kitchen waste! This squash is great on its own on a bed of lettuce (pictured here) or paired with a more elaborate meal for date night, with a side of green beans and mashed potatoes if you want to mimic the full steak dinner. To prepare, cut off the top and bottom parts of the squash, no more than a quarter of an inch. Using a vegetable peeler, peel off the hard outer skin. Then cut bottom rounded part off and set aside (see above for ways to use those remaining pieces). Lay butternut squash on its side and carefully slice it into 1/3 to 1/2 in slices, depending on how thick you want your steaks to be. Rub steaks in olive oil, garlic, rosemary, and salt tot taste and let sit for twenty minutes. While steaks marinate, heat olive oil in saucepan on medium. Place 2-3 steaks in sauce pan (the number depends on how big your squash and pan are). Let cook on one side for 5-7 minutes, until browned and softened. Flip steaks and do the same for the second side. Repeat until all steaks are cooked. Serve on a bed of lettuce and drizzle with olive oil. Makes 4-6, depending on how thick your steaks are. Enjoy! You grew up collecting uniform valentines each February. Most of them were cartoon cardboard cut-outs and, if you were lucky, kissed with candy kisses. You organized them in to hierarchies of sweetness: chocolates got top prize, soft sugared hearts near the bottom (they were pretty, but tasteless, like sweet chalk or, you later learned, a dinner date that doesn’t read). You took pity on the sentiment-studded cards without candy and put them near the middle. They weren’t the ones you really wanted though you were vain enough to appreciate how many there were. No, you saved the prized place for the homemade ones—diollied and sequined-kissed hearts on pink and red and purple construction paper. Those were the ones from the people who taught you that love is a loud, garish thing. When you have it, you need the world to know that there is glitter in your heart and honey in your veins. There is so much of it, this feeling, that you want to hold it close like a secret and release it into the sky like a wild bird at the same time. You don’t even need a special day in winter to quantify this sense—this awareness—that you are love and love is you. It was in the white blush-stained flowers so many years after those childhood cards, when adulthood lay heavy in your bones and you had begun to forget the feel of simple pleasures, those sweet things like feathers tickling your palm or the crackle of pink foil wrappers revealing candied promises. Frivolous little things. Unnecessary, yet muscling their way into your heart all the same. Then there is the gift given to you just because on a forgettable weekday from someone who wants you to know that you are valued, that they notice the long hours in which you quietly go about your work. And the one you give them, to let them know that they are seen. These secret valentines are just as sweet as the one-inch by one-inch chocolate squares, edible care that fit perfectly in the palm of your hand or the truffles you make at home, dipped in love and infused with rose petals and sweet dreams to cure broken hearts and remind you that love is something that grows bigger the more you feed it. Lately, you’ve come to appreciate the love that’s like a seed. Ready to bloom, ready to set down roots, ready to have garden-toughened hands coax sleeping stories into the light. The only thing that comes close to this are the rocks collected from a patch of earth and poured into your hands so that you don’t float away or the passed-around dog-earned pages of paperbacks because you have tales to share and discuss. Or the paper moons that keep you company as you make beeswax candles so that they may soften and sweeten a long day for those you love. Or better yet, the lovers in the tarot always reminding you that the heart behind your ribcage is whole and happy, a beating song to the universe. Still, nothing is as sweet as that seed-love, which is why you always keep seeds in your pocket. You never know when someone will invite you to bloom. Last summer, I wrote about the importance of sacred simple pleasures, those ephemeral soul-filling things that make life delicious. What followed was a season spent nourishing and prioritizing the daily joys that rejuvenated and refreshed. I returned to teaching that fall excited and enthusiastic. The experience made me realize how important it is to cultivate a wellness practice that emphasizes simple pleasures. It also renewed my belief that simple pleasures are integral to conjuring everyday magic. They are, in fact, sacred. Pleasure is significantly undervalued in our society. If it feels good, it must not be important. If it brings you joy, it’s not to be taken seriously…how many times have you heard or seen these ideas reinforced? The way people turn their noses up at romance novels is good example of this. These books have sexytimes! All the feels! People having multiple orgasms! And a Happily Ever After! So…why are these bad things? I blame this fear of pleasure on religion and a society that is still afraid of the sacred feminine. Instead of nurturing this Eros energy as an important part of our day-to-day lives, we treat is transgressive, a deviant pursuit stuffed into weekends, vacations, and any place else that doesn’t fall into the seriously business of our daily routine. It’s kind of like Dry January: people binge drink on December and then repent with virtuous abstinence come January. Why not just enjoy moderate drinking year round? Even worse, we often ignore the simple pleasures right in front of us, and thus, an important part of enjoying our day: the morning sunrise, the unexpected blood oranges at the market, the delicious cup of oolong. When we deny ourselves these simple pleasures, we deny an important part of our identity. In reality, pleasure tells us a lot about ourselves. It’s easy to identify a toxic situation because they make us feel so bad. But once we address negative issues, how do we then cultivate joy? It takes a lot to conjure and maintain happiness. We have to get used to what pleasure feels like and perhaps more time to unabashedly court its presence in our lives. Like any good reader of romance knows, the iconic Happily Ever After takes a lot of grit and hard work to achieve. We have to ask ourselves hard questions: What makes me happy? What do I want in my life? What doesn’t bring me pleasures? Seemingly simple questions, sure, but how often are we honest with ourselves about what we enjoy versus what society tells us we should be doing? I also found that prioritizing simple pleasures allows me let go of the things that complicate or otherwise being negative energy to my life. During my year of buying, using, and wasting less, I found a direct correlation between moving too fast and being less mindful, less eco-conscious, less in-tune with myself. When I paused to indulge in simple pleasures, I was able to unplug from the frantic energy of our fast paced world. Same goes for toxic people situations. Learning what brings me joy helped me better understand what throws me out of whack. Recently, I found myself in a social situation that I committed to not because I necessarily wanted to but because I thought I should be doing it. It seemed like a good idea, but my gut feeling was telling me it wasn’t my vibe. The energy was too groupie, too demanding on my time, and too draining. In the space of a week, I went from being happy and full of life, to tired, anxious, and without inspiration for my writing. Those feelings told me a lot. And in talking with loved ones, I was finally able to trace these feeling back to stepping into a zone that wasn’t right for me. Once I had that revelation, my energy returned. I felt happy again—albeit tired from this strange emotional journey. I could write again. I looked forward to my work day. And I felt joy in the littlest things. The energetic shift was shocking and made me realized how much I took my inner joy for granted. In reality, I had been so happy because I nourished the sacred art of pleasure and eschewed anything that didn’t enhance the quality of my life. It made me feel like I could do anything and everything—until I stepped into that dead zone and realized that wasn’t the case. My energy had been abundant because I cultivated abundance—and ruthlessly cut out anything from my life that didn’t enhance my overall wellness. Lesson learned. Pleasure is an integral part of my day-to-day. It helps me understand why certain things make me anxious and unhappy—and that it is okay to let those things go in favor of radical joy. Now, I feel like I have to say that this isn’t about never having stereotypically “negative” feelings or never allowing yourself to engage with things that make you uncomfortable. Rather, this is about meaningfully allowing yourself to feel what you need to feel and listen to what those feelings are telling you. We find out a lot about ourselves from painful situations, true. But it is equally important to listen to what our pleasurable experiences have to teach us. So how will I go about this year long exploration of sacred simple pleasures? I don’t have a set of rules to gauge how I indulge in this, mostly because I absolutely adore unstructured time and a lack of schedules when I’m not teaching. You could say it’s my number one sacred simple pleasure. I want to be open to synchronicity and spontaneity. Cooking and dreaming. Knitting and lolly-gagging. Adventuring and magic-making. I’ll only measure it by how nourished by soul feels. How balanced my life is. How much magic I feel in the everyday. I’ll examine how slowly—intentionally—I’m living. How often I’m comfortable in asserting my needs and desires. How delicious each day tastes. What simple pleasures are sacred to you? Why? Here’s to a year of cultivating pleasure! Last year, I committed to a year of buying, using, and wasting less because of environmental concerns and an intrinsic desire to live more and more in union with nature. I’ve been increasingly concerned about climate change, especially after the shocking reports that came out in the second half of 2018. The reality is, we all over-consume and waste resources. We’ve been conditioned as a society to value conspicuous consumption and retail therapy. Big companies and countries certainly play a large role in climate change, and it is wonderful that the U.S. recently elected many government officials that care more about climate change than in previous elections—ones that will aggressively protect our planet. It is essential that we hold big businesses and governments accountable for their part in the fight against climate change. I am beyond excited to see the news stories about cities banning one-use items (including my hometown Albuquerque! ), states building plans to go 100% sustainable, and lawmakers shutting down loop-holes for big businesses trying to get out of new green initiatives (I’m looking at you Exxon). I also think we, as individuals, need to hold ourselves accountable for our role in climate change. After all, big businesses continue to produce one-use items and fast fashion because it is profitable. Why? Because we buy their products. In that context, it becomes clear that the individual has a tremendous amount of power in healing the environment. Our money—what we choose to spend it on and what we refuse to purchase—can shape the market and shift the economy away from disposable consumerism towards a sustainable future. This requires us to be hyper-conscious about what we need and how we spend money. So how to you unplug from mindless consumerism and live more consciously? It was an interesting journey. First, I had to be completely honest with myself about what I purchase, use, and waste…and how to scale back. That meant resisting the quick high of retail therapy, thinking about ways to repurpose household items, and taking an honest look at what I actually use each day and what quietly gathers dust on a forgotten shelf. Many people think that trying to live more sustainably makes your life more complicated and costly. I found that it actually simplified my life and helped me save money. Now that I’ve finished my year of using, buying, and wasting less, I plan to continue going more and more zero waste. Frankly, we should all be aggressively moving towards greener living given our current environmental crisis. This decision has also transformed other areas of my life in ways that surprised me. Using, buying, and wasting less meant I was taking better care of myself, saving money, and engaging with my local community in more meaningful ways. Talk about conjuring positive energy! 1. Sustainable living is a form of radical self-care. I’ve said it before and I’ll say it again, sustainability is a spiritual practice. Tuning into the needs of the earth helps me stay grounded and connected to myself. It’s easy to start moving too fast and become disconnected from ourselves in this go-go-go world. When I committed to a greener lifestyle, I had to slow down and consider what I really needed. I found myself enjoying what I had more, skipping needless errands in favor of an afternoon walk, and happily rejecting impulse purchases in favor of money in the bank. Instead of indulging in retail therapy, I had to find other, healthier ways to destress. I did yoga. I meditated. I read. I knitted. I no longer used shopping as a bandaid for coping with stress. Instead, I allowed myself to feel what I needed to feel and change what needed to be change for a better sense of wellness and balance in my life. Plus I realized fairly quickly that if something wasn’t good for the earth it wasn’t good for me! 2. I don’t need as much as I think I do—so my life got a lot simpler. This year, I decided to stop (okay, severely limit) buying packaged goods, especially those items that came is wasteful plastic packaging. It only takes one video of a helpless sea creature killed by eating discarded plastic to make you hate our wasteful culture. As a result, I stopped shopping at Trader Joe’s (except, real talk, for the occasional trip down the wine aisle). Practically everything in the produce section there was covered in wasteful packaging. Suddenly, all the stuff I used to buy there made me think of polluted oceans…no thanks! I got used to mainly shopping at my local co-op (the bulk section is my new BFF) and a few other stores where could get affordable, package-free goods. I ran less errands, bought less stuff, and generally saved money and time by nixing out anything that came in excessive packaging. I’ll admit that that didn’t work so well when I had to make online purchases. One of the few new items I bought was tights for work after the ones I’d had for years ripped beyond repair. The Amazon image showed me the tights I wanted and they seemed minimally packaged. Then I got my order and found that each and every pair of tights in the set was double wrapped in non-recyclable plastic. My worst nightmare! So I learned my lesson. I have have to actively seek out eco-conscious producers who make an effort to include limited packaging (PACT Apparel is a good start to this). And, to make things even easier, I stick to my basic rule: I don’t buy wastefully packaged goods. Period. See? Simple! 3. It’s not as hard as I thought it would be. There’s a lot of panic around living a green lifestyle—it’s too expensive, too difficult, too time consuming to be practical. In truth, I’ve found the opposite to be true. I got used to bringing my own reusable bags and jars to stores, buying less and using what I have. I fell into a routine and many of the changes I made were micro-adjustments that had a huge impact., like walking when I could instead of driving. The funny thing is, the more changes I made, the more I wanted to make. I’ve spent more than a few afternoons down a Pinterest rabbit hole, learning about how to go zero-waste. The real shocker? Much of the advice I found was pretty basic—use less, buy less, and be a more thoughtful consumer. 4. Other people are incredibly helpful…and curious about easy ways to be more sustainable. I can’t tell you how many times someone has stopped me in the grocery store to ask where I got my reusable produce bags or to tell me that using my own tupperware for my deli purchases is a good idea (I don’t eat a lot of meat but I like my cheese—just not the plastic wrap it comes in). The stores I shopped at were beyond kind when I brought my own items to fill. I even inspired a few people to make their own shopping routine less wasteful by bringing their own bags. I brought my own containers everywhere, from generic grocery stores like Smiths, to local markets like Keller’s and the co-op. I even brought them to The Herb Store (my all time favorite bulk store in Albuquerque) to stock up on my usual bulk herbs and spices. Each and every time, people were inquisitive, supportive, and excited to see someone shopping more mindfully. I’ve had more than one person tell me that I’d inspired them to start doing the same. Woohoo! 5. You learn to be honest with yourself about what is truly sustainable—in all meanings of the term. Going to three different grocery stores in one week to get everything you need without packaging (none of it available in one place) is not achievable. Yup. That was a lesson learned the hard way. It’s the end of the week and you’re tired. You finish work late or simply don’t feel like a string of errands at the end of the day. Real talk: Not gonna happen. No longer shopping at Trader Joe’s because everything is wrapped in packaging? Totally achievable. Never buying anything again ever? Nope. Investing in thoughtful purchases when needed? Yup. Saying no to one-use items? So easy to commit to. In short, to keep my greener lifestyle sustainable, I had to keep it simple, otherwise it was only a matter of time before I would backslide into old less environmentally friendly habits. I might not be able to make all my own goods and give up my car (my job is a twenty-minute drive away and the bus system here is pretty sketchy), but I can invest in quality products by ethical businesses and drive less. The climate change news is pretty scary, no doubt about it. But I also believe that we got ourselves into this mess and we can get ourselves out of it. It’s easy to get disheartened with all the apocalypse-like stories flooding the media. Then I started reading more about people finding ways to clean the oceans and protect endangered species, countries banning one-use items and protecting vast amounts of natural spaces, and individuals lobbying for sustainable colleges and cities. Together, we can do so much. It starts with giving up one-use items and only grows from there. I like knowing that I’m part of healing our planet and committing to a more thoughtful lifestyle. How do you plan to be part of the change? When I say I like to make gifts for everyone in my family, I mean everyone, including the pups. (Okay, okay, lest that last statement sound too Martha Stewart-y, I should say that I’ve got a small family and we’re all pretty chill about the gift thing—but it’s still fun to treat them to some creature comforts!). 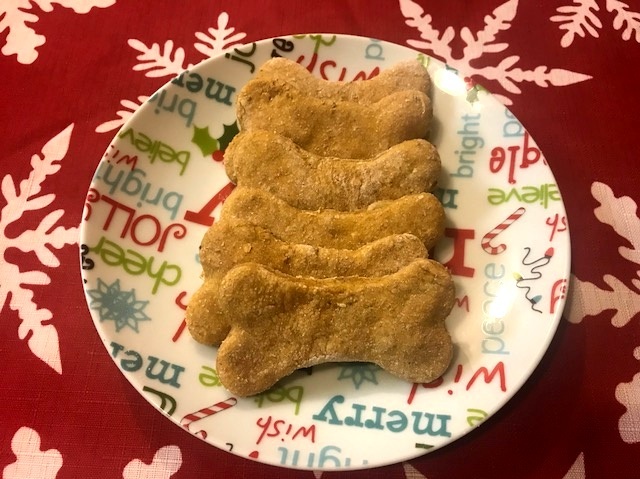 I’m auntie to several cute doggies and friends with many a lovely dog owner and I love to spoil our four-legged friends with some easy and healthy treats this time of year. Bonus: making my own treats means not purchasing things with wasteful packaging, yay! I modeled my recipe from one by Bitz & Giggles because I loved how adaptable versatile it was (also easy, because…you know me). The pumpkin puree can easily be swapped out for apple sauce, as my experiments have proved, and I’ve incorporated many a batch of apple-studded and chia-seed smattered oatmeal that I knew I wouldn’t be able to finish into these treats. I’ve even added yogurt in a pinch. I omitted the nutmeg and cinnamon, because, as their recipe states, those spices can be harmful to dogs in large amounts, so I didn’t want to mess with it. I also added a mix of white and wheat flour—enough to soak up the extra moisture from the cook oatmeal I mixed in. You are not required to buy a doggie bone cookie cutter to make them. I did just because I think it’s cute and because I once tried to use festive holiday cookie cutters…but everyone kept mistake the doggie teats for human cookies. Ooops! You can slice the dough into squares if you want or use less human-being-y cookie cutters (or just be prepared for people to gobble a few of these healthy treats too). You'll notice my recipe is a little iffy on the ingredients because I’m all for using what you have on hand. I make a bigger batch so I have plenty to give out, but you could always cut it in half. See what I mean about versatile? I would still cook them for a solid 40 minutes so they harden like a traditional doggie biscuit. I only did 30 minutes for the first round and they came out cookie-soft. Play with it and see what works best for you. All in all, these are fun to make and share with you furry friends. Plus it is super easy to whip up before the holiday celebrations and pop into the freezer for later gift-giving. Preheat oven 375. Pour wet ingredients in bowl and stir until combined. Then slowly add flour and oats until dough forms. If you’re trying to use up already cooked oatmeal like I did, then just mix it in with the wet ingredients, and add the flour after. Roll out to 1/4 inch thickness on floured surface and use your cookie cutter or knife to create shapes. Place on baking sheet and bake for 40 minutes. Serves an entire pack of wolves. Enjoy! The holidays are here which for me means more quiet time drinking holiday chai and making homemade presents like my peppermint hot chocolate body scrub, orange spice body butter, and pine and charcoal soap. Why do I bother making homemade gifts? A valid question, considering most people look at it as more work. For me though spending time in the kitchen is part of my self-care routine, helping me to unplug from the frantic pace of the holiday season and the mindless consumerism that contributes to so much waste. According to the National Environmental Education Foundation, our trash production increases by 25% around the holidays, meaning we produce an additional one millions tons of garbage per week this time of year. Yikes! That data, combined with the realities of climate change now facing us, should put all that holiday excess into perspective if you haven’t already unplugged from the mindless consumerism bandwagon. Here’s another reality: At the risk of sounding like a cheesy holiday special, the holidays aren’t about buying needless items (studies also show that we only keep around 1% of what we end up purchasing this time of year! ), but about celebrating loved-ones and taking time to rest and reflect at the close of the year. It’s also the celebration of the Winter Solstice, where we honor our intrinsic connection to the natural world and our own natural cycles. Now I’m not asking you to go full-Grinch and give up gift giving or insist that every gift you give is homemade (I know not everyone has the time of interest in that! ), but with a few low maintenance tweaks, you can enjoy a more eco-friendly holiday that’s good for the planet, your wallet, and your soul—seriously! Unplugging from the culture of buy buy buy has made me slow down and take in the soul-nourishing simple pleasure of the season. I look forward to quiet nights at home knitting and enjoying the twinkling lights of my tree, reading holiday romances with a glass of wine fireside, and taking long nature walks to relish the heady winter air. So how do we honor the festive spirit of the season without giving into wasteful consumerism? Here are five ways to green your holiday routine. Reuse that wrapping paper—and ribbons. I can’t remember when it started, but for as long as I can remember, my family always reused our wrapping paper. Well-preserved festive bags, tissue and wrapping paper, and fancy ribbons became part of a beloved holiday tradition where, as kids, we eagerly looked to see who got the snowman bag that year or the reindeer wrapping paper or the red polka-dotted tissue paper. Our growing collection of ribbons lead to outlandish present wrapping with over-the-top bows, each one more outrageous than the last. I’ve added to this tradition by purchasing beautifully patterned cloth and festive cotton ribbon that can be reused indefinitely, long after our tissue paper collection has become unusable. It’s fun, festive, and, just like unwrapping tree ornaments, we look forward to seeing our favorite present wrappings come back every season. Omit one-use items. I know, I know, I say this constantly and put it on every “Green” list I make, but that’s because it is such an important part of protecting our planet and reducing waste. Many stocking stuffers, fun little toys, and those iconic Christmas crackers are only ever briefly enjoyed than quickly discarded. All those trinkets can’t be recycled so the end up in landfills. No thanks! Instead, focus on quality items that you know your loved-ones will really enjoy. You’ll spend less and have the satisfaction of knowing your gifts will be enjoyed long after the holiday season has gone. Make your own gifts. Let me first say that, while I LOVE making homemade gifts, I only make the easy things. It’s no fun if you’re slaving away on complicated projects after all! And these gifts don’t just have to be cookies, which can feel less-than-celebratory when you’ve received your ump-teenth cookie tin and can only eat so much sugar. In fact, I love surprising people with unexpected edible treats, like my all-purposing seasoning or chile-infused olive oil. I also like to give them practical indulgences like beeswax candles or, if I’m feeling extra fancy and want to up my body-butter and soap game, a homemade bronzer for my make-up loving peeps wanting more eco-friendly cosmetics. These are all things people can use and enjoy for a long while. better still, since I’m making them, I can be sure that they are packaged in zero-waste containers (hello mason jars, my old friends!). Want more easy DIY gift ideas? Check out my recipe index for inspiration. …and buy local if homemade gifts aren’t your jam. There are so many great local stores in Albuquerque, and no doubt in your neck of the woods too. Local gifts have the added benefit of being unique—not everyone will have it—and, best of all, support the local economy. I personally love taking time to shop at holiday pop-up markets and shop and strolls this time of year. It’s nice to see the community enjoying themselves and even better to stumble upon one-of-a-kind treats. If you don’t want to give more things, consider gifting local experiences like yoga or gym classes, a crafting session, tea tasting or other fun activities people can enjoy throughout the year. One year, I got dance classes from my sister and it was so fun to try something new. These gifts could also be more personalized, as when my sister and I do a yearly deep cleaning of my parents house top to bottom, inside and out, as a special birthday treat for my mom. Sometimes the best gifts are ones that lighten your loved-ones to-do list so they can kick up their feet and relax! Real talk: we’ve also gotten to a point in my family where we don’t want more stuff or for anyone to feel pressured to purchase gifts. At the end of the day, all we care about is spending time with one another…I know, cue holiday after school special music, but it’s true! Last but not least, limit spending, aka buy less. Yes, this is another go-green list perennial because living a more sustainable lifestyle is all about buying less in general. Use what you have and, when you need to purchase something, consider opting for second-hand and antiques stores, then local, before purchasing elsewhere. This includes keeping that fake tree instead of sending it to the landfills and resting the temptation to buy Griswold-style lights for your house. Enjoy what you have and think twice about buying more just to have more. Since I’ve done this, I’ve found that I look forward to decorating my house with well-loved decor I’ve collected over the years, each one infused with lovely memories. My home feels cozy and special, not another cookie-cutter made-for-TV-movie Christmas explosion. How do you green your holiday? Each November, I love to write about stories that inspire, nourish, and delight. I think this is the perfect month for setting aside more time for reading. Autumn is well under way. The days are colder and shorter. The sanctuary of our homes calls to us as we settle into this contemplative month. We are drawn to quieter past times that give us space to reflect and heal. Over the years, I’ve written about the important comfort good stories and other simple pleasures can offer us and the power various genres have to impart wisdom. 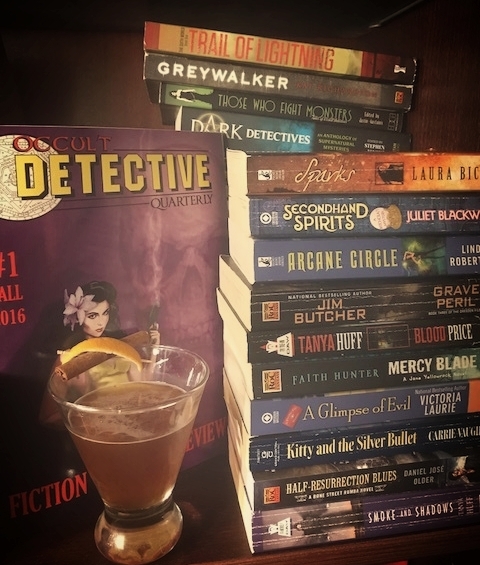 This year, I’m waxing poetic about the Occult Detective…with a cocktail recipe thrown in, because I’m a big ol’ nerd like that. So what are occult detectives? They are usually rough and tumble characters dealing with the darker side of life. Ghost hunters, if you will. Vampire slayers. Paranormal investigators. Monster fighters. And those drawn to the arcane knowledge of the occult and mystical. This archetype is found in everything from Buffy the Vampire Slayer and all other monster of the week TV shows, to urban fantasy like the Dresden Files and the Bone Street Rumba series. But what most people don’t know (unless you are a diehard occult detective fan like me!) is that this genre has a long history dating back to the Victorian Era. The 19th century saw not only the birth of the detective genre, but also the fad of Spiritualism. Popular culture at the time was obsessed with understanding, studying, and experiencing the otherworldly via séances, spirit photography, and extensive research into the occult…much like we are today. The Age of Spiritualism brought us the likes of Thomas Carnaki, inventor of the electric pentacle; Flaxman Low, a self-proclaimed supernatural detective; and, Diana Marburg, a palmist who solves murders. Then there’s Dr. John Silence, the first Victorian occult detective I ever read about, who will always have a place in my heart for introducing me to the genre. He has a mysterious past, training in the occult, and cool animal helpers like his cat Smoke and his dog Flame. At their best, these stories explored our relationship to the otherworldly and our curiosity about things outside ourselves. They show how we grapple with the mysterious, unseen forces in this world (and beyond! ), the things that often reach out in touch us in our life but that we can’t always explain away or even logically process…at their worst, we get ugly things like sexism, xenophobia, and racism. The supernatural becomes a catch-all terms for anything that isn’t white, hetero, middle-class, or male, and thus, to be feared. Yikes! My favorite part about this genre is that is has transformed over the centuries from a genre of xenophobia to one of hope and empowering explorations of otherness. Women, people of color, LGTBQ+ communities, people with disabilities, and, yes, supernatural beings are front and center in contemporary additions to the genre. We’ve got Maggie Hoaskie, a Navajo monster hunter in Trail of Lighting; Tony Foster, a gay wizard in Smoke and Mirrors; Kate Daniels, a magical mercenary and woman of color in a post-apocalyptic world; the canonical bi-sexual John Constantine; and many stories out of Occult Detective Quarterly that aims to make the genre more inclusive by representing both diverse characters and authors….just to name a few. And that’s barely scratched the surface. I mean, I haven’t even gotten into TV shows yet (I’m talking to you, Sleepy Hollow, Wynona Erp, Supernatural, Lucifer and. So. Many. Others). Perhaps what I love most about this genre is that it’s all about how magic is a hard, gritty thing. In one way or another, these stories are about what it takes to be true to yourself in a worlds that doesn’t like marginalized bodies, otherness, and those living on the social periphery. Better still, these stories teach us that living within liminal spaces—not just a human but a werewolf (Kitty Norville), not just a woman but a witch (Persephone Alcmedi), or a half-dead resurrected inbetweener (Carlos Delacruz)—is empowering, transformational even. This liminal space we occupy is the crack where the light seeps in. In the end, this genre, and the occult detective archetype, doesn’t just grapple with the paranormal, but perhaps the even more inscrutable concept of what it means to be human…even when you’re a ghost, werewolf, or technically undead. All which means that this genre deserves a drink and so do you! I thought about pairing various stories with treats and drinks, but really, there are so many manifestations of this archetype, from cozy mysteries like the Juliet Blackwell’s Witchcraft series to dark horror like Mike Carey’s Felix Castor books. I even thought of making a cocktail called the Hellblazer…before I realized that would just be a bottle of Jack and a pack of cigarettes. So I came up with a cocktail that captured the spirit (pun intended) of the genre instead. This is a riff on the Manhattan, using Amaro liquor instead of vermouth. Amor is an intensely herbaceous, bitter Italian liquor, there perfect nod to hellfire and brimstone, two things any occult detective worth their salt should know how to handle. Then add a dash of burnt orange bitters for a touch of the ghostly (though regular orange bitters would do just a well), and another dash of cinnamon bitters as the sin that warms your bones and promises a slew of bad—but delicious—decisions. Bourbon holds it all together, balancing the punch of Amaro and bitters with the fullness of vanilla and earth—the underlying hope and hard-earned sweetness inherent in the genre. This drink is perfect after a hard day of proverbial monster hunting or an even longer night of literal vampire slaying. Mix ingredients in a shaker and shake for one minute. Pour into a martini glass. Garnish with a cinnamon stick, orange peel slice, .and the ashes of the demons you’ve slayed—cinnamon stick and orange peel slice optional. Pair with a dark and stormy night and any of the occult detective stories mentioned here or pictured below. Serves one. Enjoy! Enchantment Learning & Living is an inspirational collection of musings touching on life’s simple pleasures, everyday fantasy, and absolutely delectable recipes that will guarantee to stir the kitchen witch in you. If you enjoyed what you just read and believe that true magic is the everyday, subscribe here. Want even more inspiration to make your dream life a reality? Follow me on Facebook, Pinterest, and Twitter. Thanks for following! Everyday Enchantments ~ Release Day! It’s official! Everyday Enchantments is out in the world! I can now legitimately call myself a Published Author. I’ll be honest and say that I can’t quite believe that I’ve birthed my first book. All I know is that this book never would have been possible without my incredibly supportive communities, from family and friends, to my long-time readers and fellow bloggers and writers. Of course, no manuscript achieves polish without the hard work of editors—of which I had many. I am eternally grateful for their insights and thoughtful feedback that pushed my writing to the next level. My book would not be as magical without their help! Last but certainly not least, I am forever in awe that Moon Books took a risk on a first-time author who wrote a different kind of read. Here’s to my first book (okay, maybe a little more gushing), here’s to my communities that inspired and supported it, and here’s to a magical life! It’s been awhile since I’ve concocted a cocktail recipe, and even longer since I’ve come up with one for Halloween. I love a good cocktail because they’ve always struck me as one of the most basic kind of potions. Think about it: a good cocktail can give us liquid courage, exorcise a hard work week, or even act as a temporary love spell. And as will all potions and spells, the medicine is in the dosage. Too much and it’s poison, too little and you’re Friday night is perhaps a little less adventurous (wink wink). It bears repeating that I like to avoid syrupy or excessively sugary ingredients and stick to clean tastes modeled after the classics when it comes to cocktail making. I do this because most novelty cocktail—a la Halloween drinks—are sugar bombs. Not my idea of a good time or a tasty drink. Although I call these Halloween-inspired concoctions, I have been known to drink the throughout the year, especially the green fairy, a tasty absinthe-kissed cocktail perfect for ending the workweek and stirring up some writing inspiration for the weekend. Lately, come Saturday night, I’ve been experimenting with this new drink: Witch’s Brew. It was inspired by my garden and all the herbs I cultivate there: rosemary, lavender, sage…all delicious, all medicinal, all typically associated with healers and witches because of their various magical and healing properties. I started wondering how I could fold those flavors into a tasty magical brew. I used gin as the base because of herbaciousness and went for a bold choice of mixer: chartreuse. It’s what gives this drink the verdant green color we typically associate with potions. It’s also an ancient healing tincture made from over 130 herbs. It tastes fresh, like mint and fennel, with the other herbs as a strong supporting cast. Yum! I paired this refreshing taste with lime because I love a good gimlet and its variants. The real kicker to this is what I do with the gin. 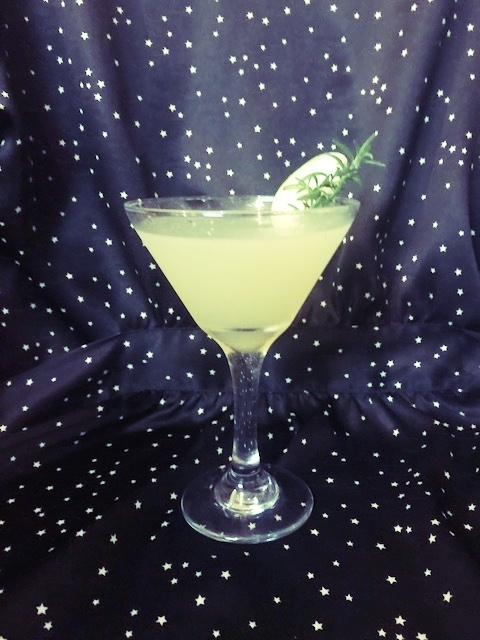 I infuse it with green apples—who doesn’t think of witches without thinking of forbidden fruit?—along with rosemary and a few juniper berries to make the herbaciousness of the gin really pop. Also because I love rosemary, the natural protector of the herb world. Juniper berries are also fast becoming a kitchen witch staple in my home. Did you know juniper both protects good energy and repels the negative? If that’s not magical, I don’t know what is! Add a dash of bay leaf bitters, for the leaf’s powers of divination. As with all spells (and drinks), feel free to play with the recipe. Chartreuse might be a bit pricy for some (though a little goes a long way so it will last a while! ), try swapping it would with rosemary or ginger simple syrup or apple schnapps (or both! )—it will change the flavor, but will no doubt be equally festive, if with more sugar. The infused gin makes about two-cups of yum—plenty to experiment with or to whip up a magical batch of this brew. All good spells require a little time, a little love, and quality ingredients. While this cocktail is a touch more labor intensive than my others in that you first need a week to infuse the gin, it’s worth it. Plus, while you wait, you can prepare the right kind of energy you want to infuse into this brew. Do you need a little more magic in your life? A little more mischief? A dash of hope or a heading dose of healing? Whatever you need, let it brew until you’re ready to infuse it into a batch of this tasty elixir. In infuse gin, slice green apple and place in clean mason jar. Squeeze juniper berries so they crack a little—this will help the alcohol absorb their flavor more—and place in jar. Pour gin over ingredients and let sit for a week, shaking when you remember to. A day or two before you want to enjoy your cocktail, throw in a sprig of rosemary that has been slightly bruised, again, to help the alcohol better absorb its flavor. I wait a little on the rosemary because the fresh stuff takes less time to be extracted in alcohol and letting it sit too long in the gin muddies the flavor. To use, pour gin through strainer into clean mason jar. For cocktail, mix gin, chartreuse, lime juice and dash of bitters in a shaker. Add ice and shake until container is frosty. Serves one—so double or triple the batch and invite your coven over. Pair with a chilly autumn night, a full moon, and a handful of spells. Cauldron optional. In just one short month, my first book, Everyday Enchantments, will be released through Moon Books. October 26 is the official release date, but you can pre-order your copy here. In anticipation of this release date, I thought I’d share the official book cover and story behind it. 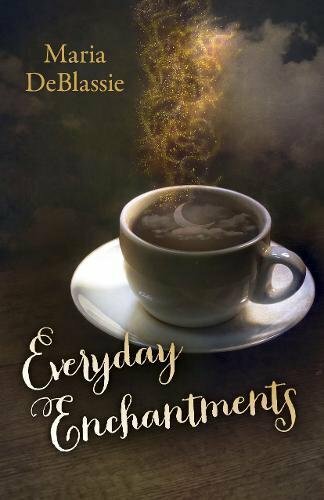 When I first started compiling the manuscript for what would become Everyday Enchantments, I always knew what I wanted the book cover to be: a cup of coffee with the hint of magic. It was the epitome of everyday mysticism in my mind. A cup of coffee (or tea, as is your preference), is one of the most ordinary objects of our day-to-day lives…and also one of the most universal simple pleasures. I wanted the image to suggest that quiet moments—like a coffee break—are fertile grounds for ordinary mysticism. So I got a wonderful designer to take my musings and turn it into this lovely cover. Then a miracle happened: Moon Books approved my dream cover—something practically unheard of in the publishing world. I asked for a new life. In return, I had to bury my seed so deep in the earth it kissed Hell. It was important that this black disk holding the heart of a hollyhock be warmed by morningstars and forced to carve its way out of the darkness. This, so that I could know the value of my transformation. Now, I am uncomfortable with tight spaces and have trouble breathing in the dark, damp underground. That is the price I paid for freedom. I dreamed of a book once, too. One with my name on it and my thoughts in it. All the Universe expected in return was blood and heartache, time and tears, and that long stretch of purgatory where no one knew what I was doing--or cared--except for the emerging words on the page. They knew. They understood. Felt the relief of stories so long contained finally spilling across naked sheets. I'm about a pint of blood short now and so have less energy for things that don't understand that my heart is buried inside an herb garden, in a constant state of becoming. I get tired if I'm away from my stories for too long, worn out when I'm asked to ignore the poetry of a Monday or the grace of a slammed door. That was what the magic required of me to see my hope eternally bloom. And I paid the price willingly. That garden? It has rosemary and words and ink and lavender in it--but no weeds and no room for nonsense. I worked hard to make it so. I picked out each and every weed and each and every shade with my own hands until my fingernails were cracked and rimmed with black dirt and my hands were bloody from the nicks and scratches of angry ghosts that didn't want to leave such a cozy home. I have a few crooked fingers now and a predisposition toward dry hands. But no weeds. No shades secretly living inside the sunflower's underbelly. Just an abundant harvest to look forward to. Magic is a hard thing and doesn't take wishes lightly. This I know, which is why I hold up deleted pages and crossed-out passages like offerings for another manuscript, another birthing. These tattered narratives will never see the light of day. They are the willing sacrifices for a better story. I bind them up and surround them with twigs for kindling. I press flame to their feet and watch the fire gobble them up because that is what the magic needs if I am to write something that is honest and potent. 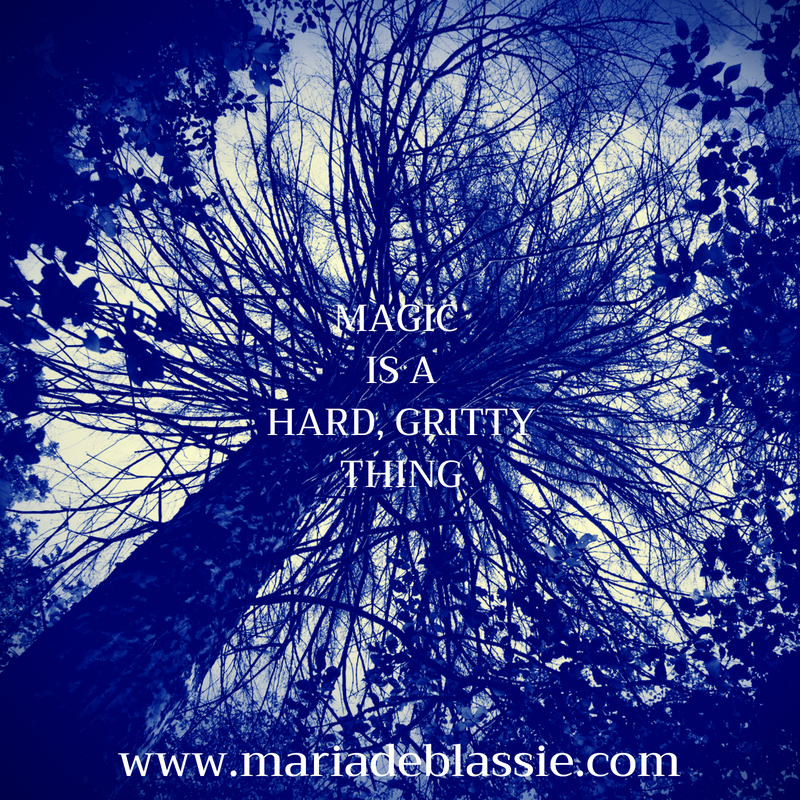 Magic is a gritty thing, asking for you to give until it hurts. That's the only way it knows you're serious and not just looking for a topical solution to soul sickness. That kind of healing requires long journeys down dark roads and through the caves of memory until all your pains are excorcised and your hair smells vaguely of brimstone and forgetting. After all that, it lets you taste the first ripe peach of summer, speckled with morning dew. Your tongue is coated in sunshine and hard-earned deliciousness. Juice dribbles down your chin. Your fingers are sticky with fuzz and nectar. And in your hand is another hard seed waiting to be kissed by morningstars. With my book coming out in just a few short months, I’ve decided to write a few blog posts exploring the heart and soul of Everyday Enchantments, my writing life, and my life life: Everyday Magic. This is the term I use to explore the mysticism inherent in our daily lives, the sacred simple pleasures that heal the soul, and the radical self-care that keeps us vital. And it is. But magic is also a hard, gritty thing. It takes its own time and works in its own way. You ask the Universe for something and it waits and watches and looks to see if you are, in fact, doing your part to make that desire come to fruition. It asks for blood and sweat, time and tears, focus and energy. So that when you ask for your Heart's Desire, the Universe first considers whether it is a wise wishing or an unhealthy infatuation. In time, if it's the right thing for you, then the wish whispered on a dandelion head will make its way back to you. Just as soon as it pleases and no sooner. Let's face it, if magic were easy, more people would be doing it. The hardest part about magic is that you have to let go of any notion that you can control all the variables in your life. Surrender. Listen to the Universe and your heart of hearts. They will tell you where you need to go--and it's often not where you think you should be headed. Magic is tricky that way. Revealing its wisdom only when you're committed not to a specific outcome but to the art of learning yourself and the cosmic world around you. It works kind of like this: When you ask for light, you might expect fireworks to go off in the night sky immediately. In reality, after hard labor, constant focus, and everyday conjuring, you get a small spark which you then nourish into a healthy fire to warm your home. Still, you get the light, but in order not to take that conjuring for granted, you have to continue to work to keep it alive. Magic is a lot like self-care in that way. When we taking about taking care of ourselves it’s often about pampering—lighting scented candles, sinking into bubble baths, taking afternoon naps. Rarely do we talk about the hard work that goes into actual self-care, like waking up before sunrise to workout because that’s the only time you know you can realistically get it in, or swearing off processed sugar because you know that as good as it might taste, it’s no good for you. Self-care is letting go of toxic situations and people regardless of what outsiders might think of your actions so that you can feel at peace. It asks you to prioritize yourself without guilt in a world that sees that as a selfish act. In short, self-care requires some serious adulting! As does magic. You walk the fine line between infinite belief and hard labor. As the common saying with writing goes, inspiration will never find you unless you're working. Neither does magic. It doesn't give anything away for free or shower you with unearned gifts. There's always a price and the best magic, your own conjured magic, tastes all the better because it was birthed from your own sweat. So you plant your soul seeds and you tend them without rigid expectations. Then one day those seeds sprout, blossom, ripen into delicious fruit if that is what is meant to happen. Those that don't, find their purpose in feeding the worms in your compost bin. But the fruit you do harvest is nothing short of divinity. It tastes of your backyard, kissed by your sunlight. Fed by your dirt and watered by your sweat. It is summer in your mouth, the promise of eternal sweetness. Magic is a hard, gritty, beautiful thing. It’s official, I’ve gone off the hippy-DIY deep-end. Actually, it happened a long time ago when I started making my own shampoo and facial cleanser! I know, every time you think I couldn’t possibly be any more tree-huggery, I confess that I’ve been doing something like making my own shower products for years. I started for a multitude of reasons, the biggest being that I have thick crazy hair that doesn’t respond well to most conventional shampoo products and sensitive skin that gets easily irritated with the various chemicals used in most facial cleansers and soaps. Even when the organic specialty products promised extra-hydration for dry locks or gentle formulas for sensitive skin, none of it worked. I ended up spending a small fortune on organic products that did nothing for me but give me brittle hair and dry skin. I’ve learned over the years that simpler truly is better. Tired of expensive, useless products, I finally tried this very simple recipe from who knows where (it’s been long enough that I can’t actually remember how I got started on this, probably from a magazine or book): Diluted castile soap with your choice of essential oils. I tried it over five years ago and have never gone back. Gone are the pile of shampoo bottles and jars of face soaps clogging my shower caddie and putting a dent in my wallet. Instead, I have two repurposed honey-bear bottles—the large one for shampoo and the smaller for my facial cleanser. Since I’ve switched to using castile soap as the foundation for both my shampoo and face soap, my skin is happier and my hair more hydrated. The trick is to make sure that you are, in fact, properly diluting castile soap. One of the things that can make Dr. Bronner’s soap seem expensive is that it is highly concentrated, which means it should never be used without diluting it. Once you do that, you understand that while it can seem pricey, a little goes a very long way! Another perk to this recipe is that is reduced the amount of packaging you buy then throw out—so say goodbye to the wasteful packaging of all those shampoo bottles! Repurposing old bottles and purchasing castile soap in bulk from your local co-op, using your own container to fill up, lets you go that extra mile in waste reduction. When all is said and done, you end up spending mere pennies on shampoo and face wash. The only real difference between the shampoo and face wash is the amount of essential oils you put in. Because the skin on your face can be very sensitive, only use 5-10 drops in your mixture. That’s enough to get the healing benefits of the oils without an irritation. For your shampoo, you can use more. When in doubt, use less essential oils than you think you need. Like the soap, a little essential oil goes a long way! Last but not least, I have a few optional ingredients you can throw in for an added boost of nourshiment and cleansing, but they aren't necessary. Experiment and see what works for you. That's half the fun of DIY-ing your beauty routine, after all! Combine 1/4 cup castile soap with 1 cup water. Add 15-20 drops essential oil of choice. I like to use rosemary because it makes your hair shinier, peppermint, or cinnamon to boost growth (it also smells really nice!). If that said, if you have sensitivities to scents, you can always omit the oils. Combine ingredients in your repurposed container and shake until combined. To use, pour desired amount on wet hair, lather, rinse, and repeat. Makes approximately 1-1 1/2 cups. Combine 1/4 castile soap with 1 cup water. Add 5-10 drops essential oil of choice. I love clove oil because it is anti-bacterial. You can add a teaspoon of honey to lock in moisture and provide additional anti-bacterial help. Or you can mix in a teaspoon of activated charcoal to clean pores and purify skin. Combine ingredients in your repurposed container and shake until combined. To use, pour a dime sized amount into your hand and gently massage into wet face. Rinse. I love beeswax. I use it in everything, from my body butters and lip balms to salves and mascara. It acts as a sealant in my beauty goodies, locking in moisture and providing a protective layer against the elements. Plus it smells divine! Like honey and warm earth. Best of all, buying local beeswax supports the bees which we need for a thriving planet and happy garden. I've fallen in love with beeswax all over again, recently, after I began making these homemade candles. I adore candles. Their dancing light turns dinner into a celebration or nighttime reading into a cozy retreat from the world. Their open flames seem made for whispering wishes into and their warm glow chases away the darkness like no lamplight can. In short, they are one of my sacred simple pleasures. I enjoy the homey task of making them, especially last week, as I cleaned and prepared my home for the coming summer solstice and enjoyed a candlelit night once the sun set on the longest day of the year. Beeswax candles are one of the purest candles out there, free from yucky chemicals and artificial ingredients of mainstream candles. They have the added benefit of purifying your home. While most candles actually release toxins into the air while they burn, beeswax candles release negative ions as they melt which neutralizes the positive ions create by allergies and other pollutants. Bonus: It makes your home smell like amber, soft and sweet, like the honey it comes from. These homemade candles are ridiculously easy to make, as are all my recipes, natch. I prefer to use old toilet paper rolls for pillar candles and egg cartons for tea lights, rather than pouring them into jars. The jars are nice, but I hate the build-up of candle containers; plus, I just love the look of pillar candles. Feel free to use jars if you prefer them (or reuse old candle tins). These candles make wonderful gifts. I like to make a big batch since they are so easy to make, to have on hand for last-minute gifts or give to my family. Once the wick on your candle has burned down, don't throw the wax out! Use it to make new candles. Beeswax is super durable and long-lasting, so you can just keep reusing what doesn't get burned up. This recipe also works well for any candle wax you've got lying around. I melted down one of my favorite chakra candles and refashioned it into a new one. It beats spending a small fortune on new candles! I've made my beeswax candles two ways: with just the beeswax and with a little coconut oil thrown it. The pure beeswax candles emit a softer, lighter glow, while the ones with coconut oil burn brighter and faster. If you use a jar, you will for sure want to use coconut oil so that you can more easily remove leftover wax once the candle is done burning. To make, roughly chop wax and place in the large tin can. Fill saucepan halfway with water and place on stove. Put can in saucepan. Burner should be on medium heat. Stir occasionally until wax melts. The time on this varies, depending on how much beeswax you use and how small the wax pieces are. It will take at least twenty minutes. I typically put it on when writing so it can melt while I work. If you are using coconut oil, melt it in a separate tin can only once your beeswax is melted, as the coconut oil melts more quickly. Once it's melted, combine with the wax and stir. Remove melted wax from heat and let sit about five minutes to cool. While your wax (and coconut oil, if you are using it) is cooling, spread parchment paper across a baking sheet and line up your paper rolls. You can also use the bottom of an egg carton if you want smaller candles. To make candles, pour a dime-sized bit of wax into the bottom of the rolls sitting on parchment paper or in the egg cartons. Then place the metal bottom of your wicks into the wax. This will serve as a solid base. Once you've done it for all your candle molds, line one or two skewers or other straight objects across the middle of your rolls (or carton) so that your wicks are neatly sandwiched between them. This will ensure that they stay centered. 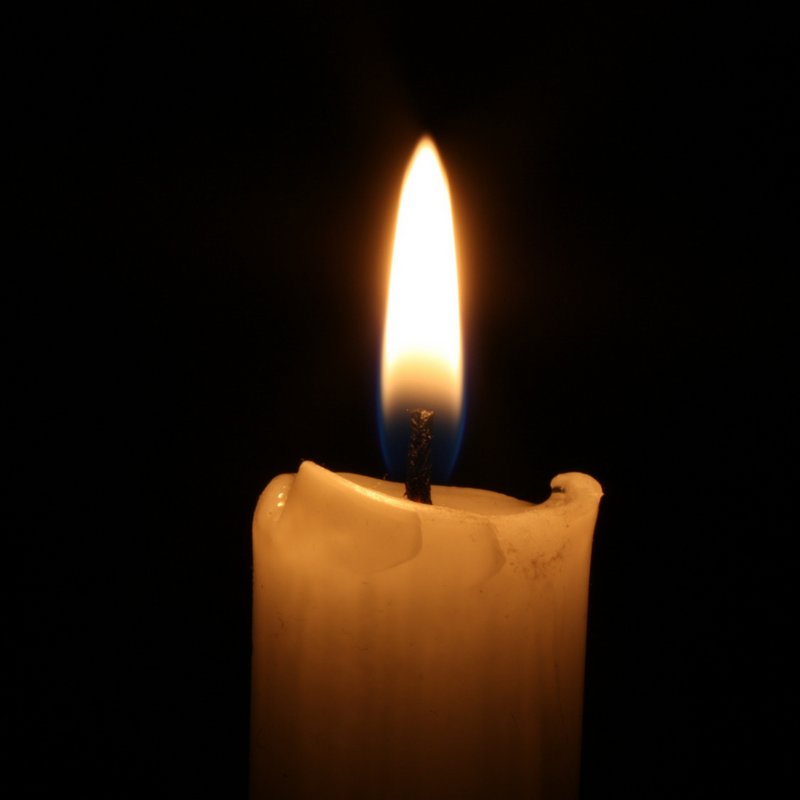 For smaller candles, simply cut the desired wick size and place it in the cooling wax. Pour wax slowly into molds. Note: If the wax isn't cool enough, it may leak out of bottom rolls, so make sure it has enough time to cool. I forgot to the first time I made these and had wax puddles forming outside the molds--luckily I could just let it harden, scrape it off, and remelt it! Once the beeswax is poured into the molds, let them sit until hardened, usually an hour or two. I keep them on the baking sheet so that I can move them someplace where they won't be in the way. Once they've hardened and cooled, simply peel away the carton or roll and you've got yourself a lovely collection of beeswax candles! At the start of last summer, I'd just completed the major edits on my first book, Everyday Enchantments, and needed time to goof around and recharge after such a big accomplishment. Needless to say, I wasn't doing much writing! This summer, however, I find myself longing for unstructured time and, frankly, more quiet time. It was a lively action-packed teaching year, to say the least, and it has taken me time to decompress from the excitement. I find myself indulging in long afternoons writing to the soundtrack of lazy birdsong and late nights reading juicy novels...and mornings? They've been spent losing track of time. In the garden. At the writing desk. In the kitchen. You name it. I'm an introvert at heart and find I've needed to nourish that aspect of myself more. My quiet soul needs time to talk to the ladybugs that find their way into my lap and dance under the moon. Not that I don't love my adventures--I've had plenty of those too and look forward to more over the summer. This time away from the work desk has made me realize how structured my life is--happily so, I'm a creature of routine after all! But I realized my life had been more than structured: every minute, every second seemed like it had been taken up with one task or another. Yuck! I love my routine, but an integral part of making your routine a ritual is in allowing space, time, light to flow throughout your day. That's why this summer, I've decided to embrace the gentler pace the season promises and relish anything and everything that makes me slow down and tune into myself. I want to linger over a glass of wine while watching the sunset and greet the morning birds with songs of my own--and a cup of coffee, natch. I want to spend time in the kitchen playing with recipes and spells I don't normally have time to make and conjure. I want to wear flowers in my hair and feel blades of grass between my toes. I want to prioritize delicious living and tiny daily delights. Why? Because I'm coming to see simple pleasures as something sacred. And we should make more time for sacred things. We need to in order for our souls to grow and flourish. So unleash yourself. Let go of heavy mundane things that make it impossible for you to sleep in on a Sunday or linger over a cup of tea. Resist the temptation to fill up your calendar with one thing after another. Slow down. Give up schedules--at least for a day or a few hours here and there (I know we all aren't off for the summer!). Remember what it was like to be the kid running around in the backyard, blowing bubbles and twirling for no reason except that it's fun. Get lost on a long walk. Find yourself in a good book. Listen--just listen and nothing else--to an old record because you haven't done it in forever. Whisper secrets into a candle and let it whisper back. Treasure these moments. Honor them. They are sacred. Pleasure is sacred. And simple pleasures are one of the most profound experiences of all. Here's to a summer of sacred simple pleasures! I know, I know. Vegan bacon is a total oxymoron! Strange name aside, I can promise you that it tastes delicious. I began my quest for healthier breakfast sides after I realized this past winter that I was eating more and more bacon come the weekend which was bad for my waistline and health. Then I realized what I really loved about bacon is that it made me feel fancy. Breakfast could be a decadent diner plate with scrambled eggs, buttery toast, and yes, bacon. So then the quest began. How do I make a healthier weekend breakfast side? I was inspired by these recipes from Minimalist Baker and Veganosity, but as always, modified them so that I didn't have to buy any special ingredients--those things that usually end up getting used once and then thrown out (yet another attempt for me to waste less is to buy only condiments and ingredients I know I'll use). An added bonus to this recipe? Eating less meat is better for the environment all around, not just for your health. Typically I avoid most things called vegan because they end up being highly processed. I would also rather eat something that tastes like what it is, like tofu for example, rather than beef flavored tofu. I mean, how many gross additives and artificial ingredients go into making fake meat? Yuck! All that artificial stuff is hardly good for the environment either. There are, of course, a few exceptions, like this bacon and my vegan fudge, both of which use only natural ingredients and only foodstuff that I already have in my pantry: maple syrup, amino acids, garlic, and chipotle chile powder. Together these ingredients make for a sweet smokey flavor akin to bacon. If you have never used amino acids before, give them a try! I started using Braggs liquid amino acids as a healthier substitute for soy sauce and haven’t looked back since. This recipe works well with eggplant (pictured here) as well as mushrooms. I have even seen people use carrots and turnips, though I have yet to try those options. You can slice these longways or, as I prefer, in circular discs. The big thing you need to make sure you do is to use a mandolin or other sharp cutting tool to produce thin, even slices so your pieces cook evenly. If they are too thick, they won’t have that crispy bacon feel. All in all, this vegan bacon is the perfect blend of crispy, salty, and smokey--and it goes great with scrambled eggs and toast! Combine all ingredients, except the eggplant, in a shallow pan or bowl. Then place eggplant slices in mixture and let marinate at least 30 minutes. I usually let them marinate overnight for best flavor. To cook, squeeze the moisture from eggplant piece so they are as dry as possible. This will ensure that they get crispy while cooking, not soggy. Heat oil in frying pan on medium. Once the pan is hot, place first round of eggplant on pan’s surface and cook without flipping for 1-2 minutes, watching carefully so that pieces crisp up, not burn. Flip pieces and repeat on the second side until browned. These are best eaten hot with scrambled eggs and toast. Serves 4-6. Enjoy!